Kids Flying Alone-A Big First For Our Family! Yesterday was a big day for our family. 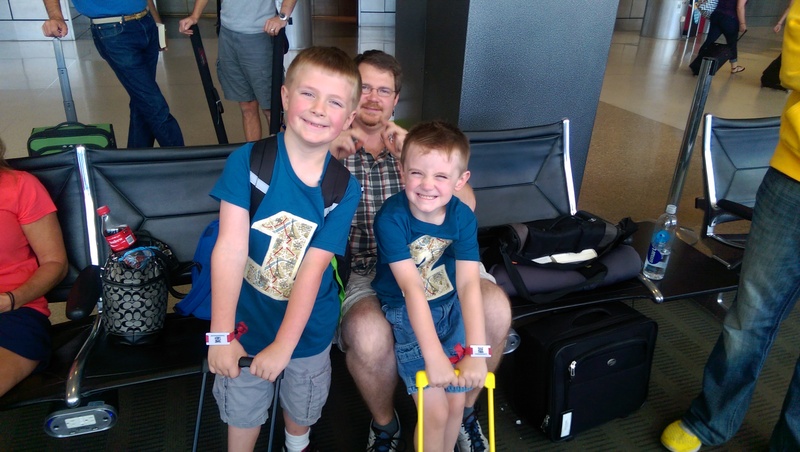 My 5 year old and 7 year old sons flew for the first time as unaccompanied minors. I was nervous, but deep down, I knew they could handle it with all of their previous experience flying. 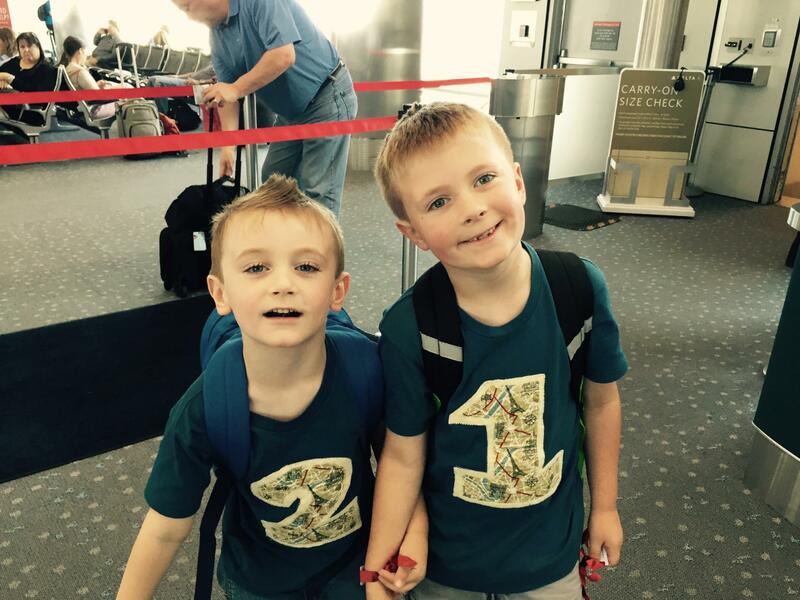 They took a direct flight from Seattle to Denver and met their grandparents at the other end. One thing that made it easier for us to decide to let them go alone was the change in the law a few years ago that again allowed parents to walk their children to the gate and for the receiving adult to meet the children at the gate. After 9/11, there was a period where children had to be given to an agent before security and then the picking up adults had to wait outside of security for the airport agent to bring the child off the plan and outside of the secured area. I didn’t want to trust a stranger to look after my kids in a busy airport and I am so glad that the rules now allow parents and designated adults to take children to and pick children up from the gates. The logistics included filling out paperwork for the receiving adult (that could be done online) and paying a fee (for Delta it was $150 each way but covered both of my children traveling together). When when my husband and I arrived to check them in, we had to show a government issued ID in order to get our passes through security. Then we had to fill out some information for the kids on a special unaccompanied minor envelope and verify the name, address and phone number of the person picking them up. The kids each got a bracelet with a barcode on it as well. Getting some wiggles out before the flight. We had opted for the boys to have a backpack for their Kindle Fires and a few other books and small toys for when they were on their trip. They also had headphones and some snacks (Uncrustable sandwiches and cheese sticks). We opted for them to take their roller boards on the plane rather than checking them in an attempt to make it easier on my in-laws. However, we forgot that they would need their booster seats for the car on the other end that they would need to be checked under the plane anyways. Oh well. On another note, my in-laws treated my kiddos to this trip, and as it turned out, it was fewer miles to book a first class ticket than a coach seat. So not only were they flying alone for the first time, they were doing it in first class! Lucky ducks! It was a weird feeling knowing my boys were on that plane and I was not! So what was my biggest fear about letting them go? Not that they would not get to my in-laws once they landed or that someone would do something to them on the plane (though I did read a super creepy story about a guy trying to touch a young sleeping child sitting across the aisle from his mother!) My biggest fear was that in flight, something would go wrong, they could crash or perhaps someone did in fact try to take over the plane and crash it, that regardless, my babies would have spent the last moments of their life alone and scared without me able to be there to comfort them. And with that lovely image in your head, I am happy to say that nothing bad happened at all and they are safe and sound in Colorado with their grandparents having a grand ol’ time! But I still can’t wait to see them next week when we drive down to meet them. Stay tuned for our 2nd trip of the summer, this time on our home turf of the “Wild West” USA where I will be driving a huge circle around America’s west through 10 states with the 3 kids. The first quarter of the trip I’ll have my husband and just our 2 year old, the 2nd quarter I’ll be solo with all 3 kids from Colorado to Texas, the 3rd quarter my mom will join me from Texas to Arizona with all 3 kids and the last leg of the journey I’ll be alone again with the 3 little ones as we make our way back up to Washington from Arizona with a stop through Las Vegas! Safe and sound on the flip side with their grandparents! Well here we are in Japan! I just woke up on our official Day 2 and am excited to have internet access and a cup of tea, at 4:30 a.m. local time. Our jet lag has been minimal but has included starting our days at 6:00 a.m. and today 4:30 a.m. But I can’t complain! It turns out that taking an evening flight, where the kids were tired and then landing in the country at that country’s night was a great idea. We didn’t have a “red eye” per say, but we did leave at 8:00 p.m. Seattle’s local time, which after the 9 hour and 50 minute flight to Tokyo, we landed at 10:00 p.m. Japan local time. 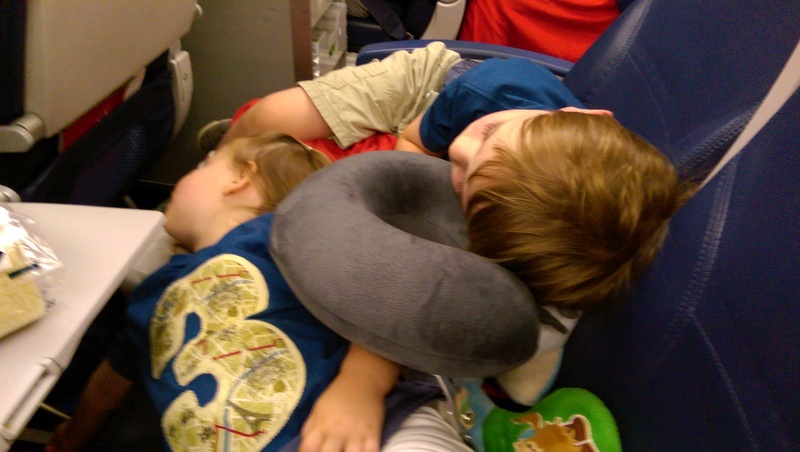 Over-night flights can be risky with kids. The hope is always that they sleep, but then sometimes they don’t because of the new environment, cramped quarters, and, in an international case, unlimited free kids tv! In our case, the kids slept for about 5 hours and I got 3 hours. Which meant just enough for them not to be completely exhausted and cranky when we landed so they could walk off the plane and help with their luggage and get us to the hostel we were staying at for the night. That’s the part I was worried about. Since I was flying alone with the 3 of them and would have to figure out how to get from the airport to the other side of Tokyo, I was praying for just enough sleep for them to manage but then still being tired enough to go back to bed once at the hostel. I got both, 5 hours on the plane then 4 more hours for all of us at the hostel, bringing us to 6:00 a.m. Monday morning in Tokyo with everyone in a good mood and ready to start the day!!! Loving our shirts by Baby Bird Designs! Here’s a little recap of our journey just to get to Tokyo for what will be an 18 day adventure! 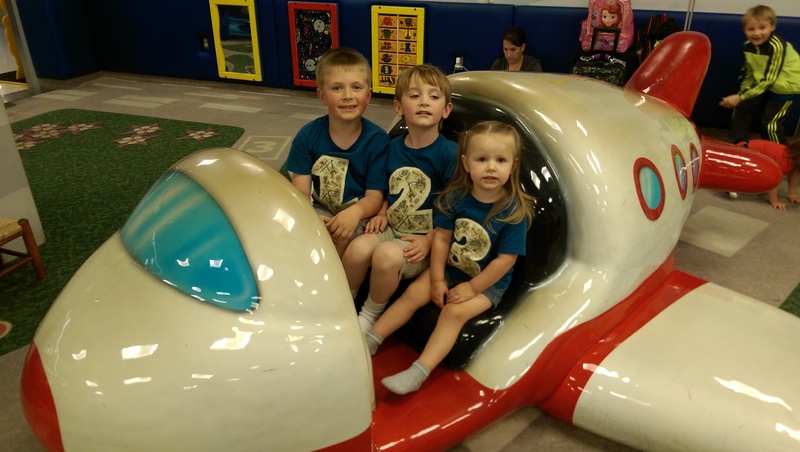 To help me quickly be able to spot my children in a crowd and help others see which ones belong together in case one wanders off, I like to dress them in similar clothing. 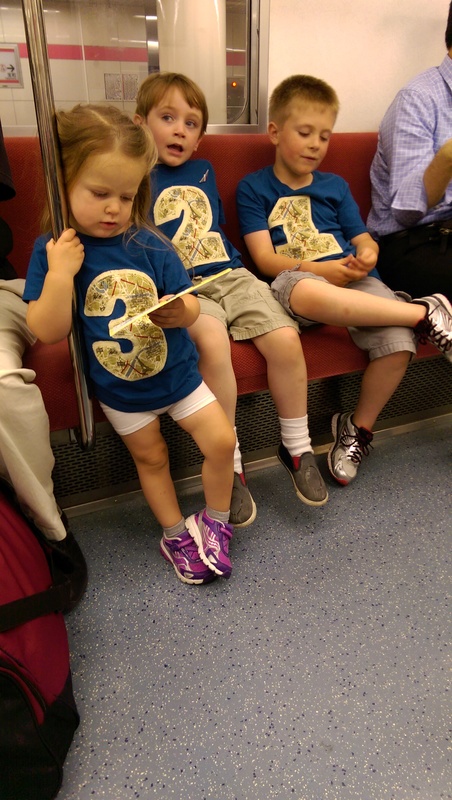 I had a friend (Baby Bird Designs) makes special shirts with numbers on them so I asked if she could do a travel pattern with the numbers 1, 2, and 3 for my kiddos. They turned out so cute and were very helpful, and drew lots of compliments. They also each get their own backpacks with a few fun items for the plane and gives them something to be responsible for. Once we got checked in, breezed through security, and then killed the extra time at the airport’s playroom, we headed to our gate. The plan ride itself went much better than our last 6 hour trip to Mexico. My 2 year old daughter sat in her seat this time and didn’t complain about the seat belt (too much). The 5 and 7 year olds, who have been traveling since infancy, were a breeze and I always welcome the extensive free inflight entertainment options that Delta provides on international trips. We had special gluten free in flight meals pre-ordered as well as kids meals, however due to a delay error on our part and my oldest son’s separate reservation (his ticket was purchases and ours were on points), we weren’t able to get him a kids meal. The special ordered meals were good, but the regular adult options for the flight were not very appealing at all to my son. So the was mistake #1, not ensuring we requested all the special meals far enough in advance. But there was enough “dinner” to share and make everyone happy. We all slept through the mid-flight ice cream snack, but sleep was more important! 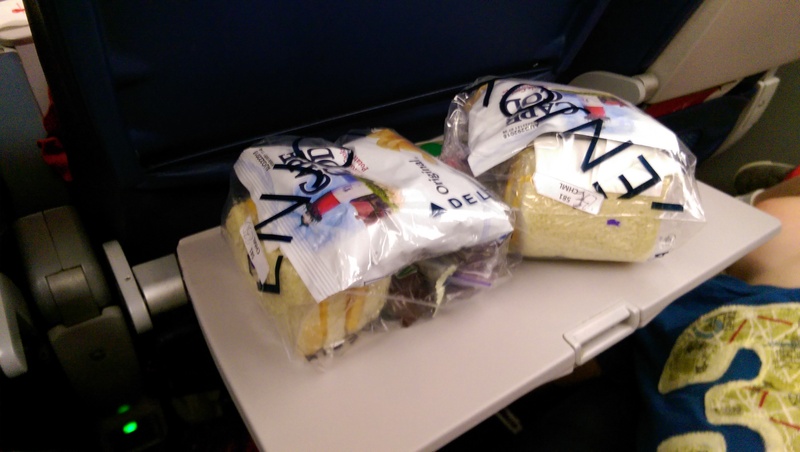 An hour before we landed, they handed out egg and cheese sandwiches with yogurt to all the passengers and I got a gluten free breakfast package in a draw string baggie that included a yummy chicken salad, grapes and a gluten free Udi’s roll. The special breakfast snack for the kids included cheese sandwiches, grapes, a bag of chips and a piece of chocolate. They were still pretty tired and after already having had their normal dinner, I stowed away the snacks so they would have something to eat at the hostel in case they woke up ready to go before anything was open. The draw string bags that these came in were very handy! Arrival in Tokyo was fairly smooth. It was a long walk to get to the first part of customs from the plane, but we took it in strides and there were moving sidewalks, which is still something my kids are mastering. Of course we also needed a pit stop at the bathroom, which was a fun experience for the kids in itself! 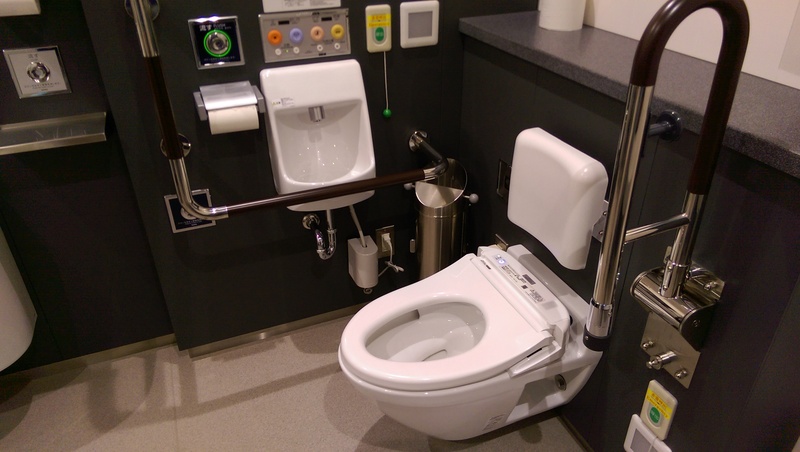 A modern Japanese toilet is almost like a video game, and this one was mild. Our first top was to go through the immigration control, then we got our luggage and heading through the customs control. The process was relatively quick and the personnel were both polite and helpful. Once we cleared all that, we were out in the open and on our own to discover our transportation options. Our hostel, K’s House Tokyo Oasis in Asakusa, gave some distances by foot to their building from the public transportation stations in their area. I didn’t pay enough attention to the fact that there were two stations with the name Asakusa on them and just picked up on the “3 minutes walk” from a station with the name Asakusa. That would prove to be mistake #2. I asked the information agents if they could tell me how to get to Asakusa Station. She told me which train I needed to take, where to get cash and where to buy the tickets. Everything was really close together in the terminal. From the time we got out of customs and onto a train into the city was about 20 minutes. The ride into the city was about 40 minutes though our walk from the train station to the hostel, was more than I had planned. Japanese toilet at the airport. The subway train was clean and we had enough seats at 11:30 at night. But the map for the lines and stops were hard to figure out and the English didn’t start till you got close to the main stations. Nonetheless we found our stop and managed to get our stroller, the 3 kids with backpacks and 3 suitcases off the train. The bad news was that elevators and escalators only got you so far up and then we were faced with two flights of stairs to get out of the train station. The boys managed the small suitcases fine. At this point I was so glad that I decided to take my Baby Jogger City Select. The back wheels on this baby are big and that made it possible to pull the stroller up, step by step, without too much impact on the child in the seat. Mind you, I still wish we DIDN’T have to do that and I’m a little concerned about the use of our stroller with the subway for the rest of our trip. We’ll see what’s in store. My 2 year old helping with the map on the subway. The last piece of bad news is that my free data roaming with my T-mobile plan is SLOW and will not render maps in detail, which makes navigating, especially at midnight in a foreign city with all signs in kanji, very difficult. After struggling to get to the top of the stair and looking around aimlessly, a nice Japanese man asked if we needed some help. I gave him the address of the hostel and he tried his best to look it up and point us in the right direction. He did point us in the right direction, but the walk was a little over a mile. We finally arrived at the hostel, and encountered two Australians who were smoking outside the door. They greeted us and asked if we needed the door open and we learned that the check in staff was not on duty after 10:00 p.m. I started to panic before we even got inside, it would be just my luck that we made it all this way and had no place to sleep at 1:15 a.m.!!! We quickly saw that there was a tiny shoe foyer were we needed to take off our shoes. It wasn’t so much of a problem for having to take off the shoes, but my 2 year old was asleep in the stroller and I wasn’t sure I could manage taking her out and getting everything else inside. So we pushed the stroller through. Thankfully, at the counter there was a little envelope with my name on it! We had keys and a room after all. There was also a small elevator that the stroller fit, which was a huge relief! At 1:30 a.m. we were in our tiny room with a set of bunk beds, a single twin and a closet bathroom. I was ready for bed! So were the kids, for about 10 minutes, then everyone was hungry. I pulled out our airplane food, laid out a towel on the floor and we had ourselves a picnic. Then we were all ready for bed. And that my friends, is how we got through our first “night” in Tokyo. More to come soon! Condor Airlines, Worth A Try With Kids? My experience flying a lesser known airline to Europe. They are as competitive, and sometimes cheaper, than other airlines for a direct flight. The flight to Germany was not as nice as the flight back to the US, even though we had Premium Economy on the way to Europe and only Coach Class on the way back to the US. Kids’ meals cost extra!!!! And the regular meals were not as likeable as other airlines for kids. Meals for special diet’s also cost extra! And they are not cheap. If you book more than 30 days in advance the fee is about $20 (depending on Euro exchange rate at the time) and $24 if you book under 30 days prior to flight. I packed my own gluten-free food. Staff in all directions were friendly and accommodating for kids. Each seat had an individual TV monitor. If you had your own headphones, you could watch one new release movie for free and about 3 TV shows. There were NO free shows for children. 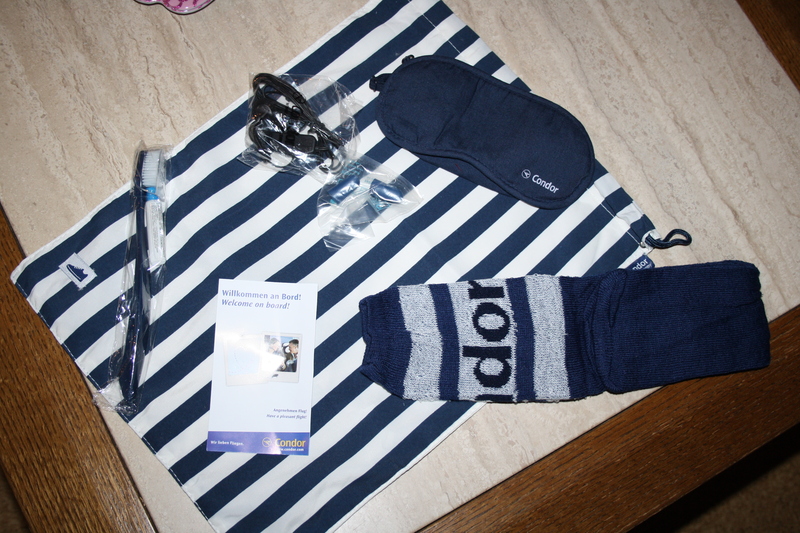 On our flight from Seattle to Frankfurt we received a small toiletry kit since we were in Premium Economy Class. But we did not get anything special for the kids. On our flight from Frankfurt to Seattle, we were in Couch, so no toiletry bag, but they gave us some really cool toys and activities for the kids! 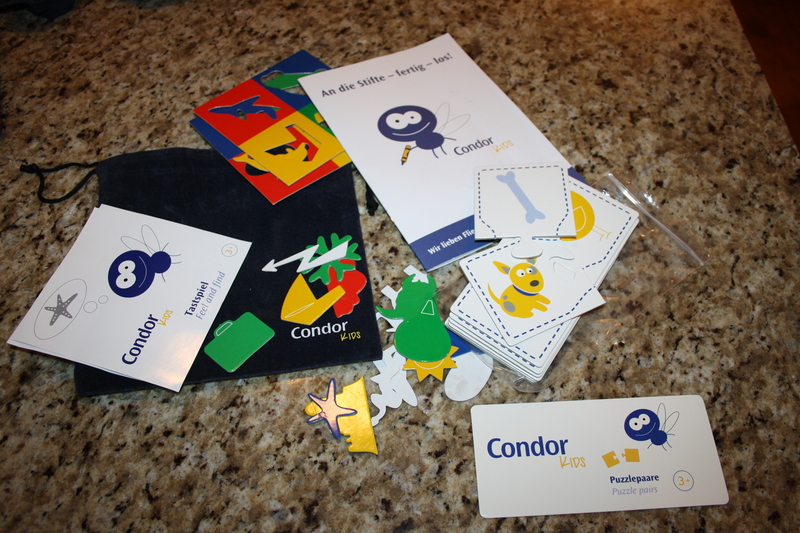 Activity sets given to children by Condor on the flight from Germany to the US. Breakfast in Premium Class to Germany. Butter, cheese and game inside the covered area. Toiletry bag given in Premium class. These socks were reused in unexpected colder weather as leg warmers for my 18 month old and the striped bag they came was reused several times on the trip. 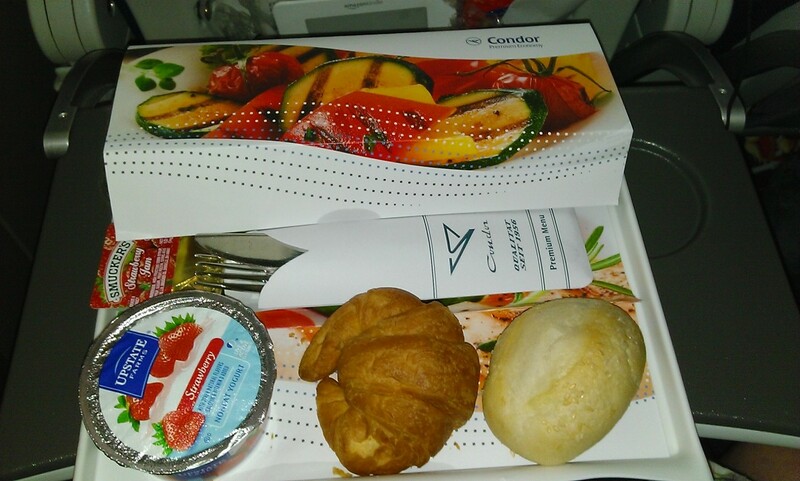 A few things made me consider taking Condor Airlines for our flight to Europe. They had a directly flight from Seattle to Frankfurt. The price was one of the most reasonable at the time. I actually didn’t have much of a choice at this time as our former neighbor girl’s family only felt comfortable with her flying German affiliated airlines and she would be flying with us back to Germany after her month stay in the U.S. with us. Thankfully, we planned well in advance for this trip and #2 was actually true, they were offering some of the better prices at the time. I also wanted to try them anyways as who could resist a non-stop flight to Europe with kids! Those of you who’ve changed planes in Heathrow know what I’m talking about!!! So here is the breakdown of our experience flying in each direction. We were running late. Not, the gate is closing in 20 minutes late but not the full 2-3 hours before your flight that they always recommend. We were there and hour and a half before our flight. Given that, you can imagine my surprise when we got to the ticket counter and there was no line. We were helped right away. There was a special going on since the Premium Economy and Business class was so empty, they were offering 2 for 1 upgrades and the Premium Economy upgrade was $200 bucks for 2 seats. Since we had 4 seats and a through the night flight, I took the upgrade and spent the $400. Our German neighbor girl contributed some for her seat too. So far, so good right? Well, kind of. Even though there were six agents behind the 3 kiosks, there seemed to be some confusion about which computer they could process the upgrade and how to have us all together after they said they could have us all together. Then, add on top of that, another angry passenger who didn’t bother to read the rules for the airlines (he specifically said he didn’t have time to read the policy and that he can’t be held accountable) was throwing a big fit because they wouldn’t let him take his carry-on on the plane as it was 15 pounds over the weight restriction. Yes, this airline apparently checks carry-ons for weight restrictions if they look oversized or heavy. He even went as far as to pointing at us demanding they check our carry-ons because he “KNOWS” they don’t meet the weight restrictions. Some of ours didn’t but we could move around between the bags to make them meet weight. But since we were upgrading to Premium Economy, we got a higher weight allowance anyways. In the end, it took 6 people who all seemed a bit confused, to get us upgraded and deal with the other passenger and left us with just 40 minutes to get through security and to our gate. We made through security and to our gate just in time to make the pre-boarding for small children. The staff was friendly from the start and we did have a nice amount of extra leg room in the Premium Economy and baggage stored nicely. I was happy to see the monitors at the back of the head rest and that we had comfortable over the ear headphones for the kids. Our main problem with the flight however, was lack of water and the cabin often was warmer than seemed necessary. When we did get water, the water was warm. Apparently, they ran out of ice mid-way through the flight. I would say that was my biggest complaint of the journey, insufficient hydration. Thankfully we had our own water bottles, but it was complicated to use the ones we brought. (See previous post on why). Once we arrived in Frankfurt, it was relatively easy to get off the plane, make our way through passport control and get our luggage. 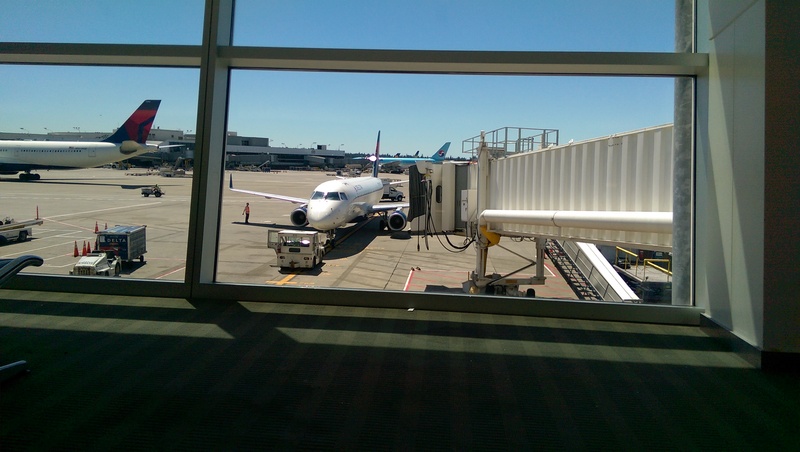 It was a very rare occasion that I was actually really early to the airport, and good thing! We arrived 3 hours in advance to find an incredibly LONG line to check in and check bags. For most flight to the US from major international airports, you cannot use the self check-in kiosk. You must show ID to an airline employee. The information lady told us it would take about 15 minutes to get through the line. It took 45 minutes. Still however, it was not as long as the line of people behind us when we finally got to the counter. They had about 12 different agents at computers checking people in. From there we went towards the gate. For flights to the US, the security is actually just before you go to the gate, rather than the general airport security. We waited about 20 minutes in the long line before we got close enough that an agent saw that I was with 3 kids and a stroller and pulled us up to a special line. Of course not everyone arrived 3 hours in advanced and due to that and the security rules, it takes longer to get everyone through to the gate. So our flight took off about 20 minutes late. Once on the plane, we headed to our seats in coach class and found a new bottle of water in each seat. WAY nicer than having to nearly beg for water on the flight over and then to just get little cups. We settled in fine, less room of course from Premium Economy, but standard. One annoyance was no plane for alternative payment when their credit card machine was broken and we wanted to buy the code to access the full Premium TV package. About an hour after it was announced that you could buy it, we finally were able to pay and purchase the package and watch something. Shortly after we got the digital entertainment squared away, a crew member came by and handed out various toys and games to the kids on the plane, something that was never offered to us on our flight from the US to Germany! In all, I would fly Condor again if there was a significant difference in price between them and the other airlines. By significant I would say at least $200 less than other tickets given that on Delta and British Airways, I can get kid friendly meals and gluten free meals for free, more free kids and adult movies and kid activity packs in each direction. With the extra fees for entertainment and meals in both direction, that would add up close to $200.